Promoting your business may seem daunting, but with the right tools and strategy, it doesn’t have to be. Knowing how to properly put together and send a newsletter is an important part of running promotions, notifying your customers of new products or designs, and driving traffic to your website. If you aren’t quite ready to send a newsletter, learn how easy it is to get started! If you don’t have an email service provider (ESP), Mailchimp is a great place to start. Below is a helpful guide on how to craft the perfect newsletter. One of the most important aspects of sending a newsletter is the subject line. It’s the first thing your readers will see in their inbox. Without an eye-catching message to encourage your audience to click on the email, your newsletter could go unopened. Preview text gives your reader a preview of what’s inside. It’s just as important as the subject line. You can see in the example below that the subject line and preview text let the reader know the overall theme of the email as well as its contents. Don’t wait for a sale to engage with your customers. Having a weekly schedule for sending newsletters encourages customers to visit your website and helps you build a lasting relationship with your customers and fans. Different types of newsletters might feature promotions or sales, new product alerts, and new design launches. Below are a few sample schedules to help you organize your different newsletter sends. These emails should all have a similar feel, but not necessarily include the exact same message each time. What is super important is that the promotion is front and center, and showcases products in your catalog. Because sales aren’t typically a weekly occurrence, it’s important to pick a day to regularly engage with your newsletter subscribers. Whatever schedule you choose, make sure your email has a purpose and encourages your subscribers to click and visit your website. Linking to your website is an essential part of driving traffic not only to your homepage, but to specific products or collections. 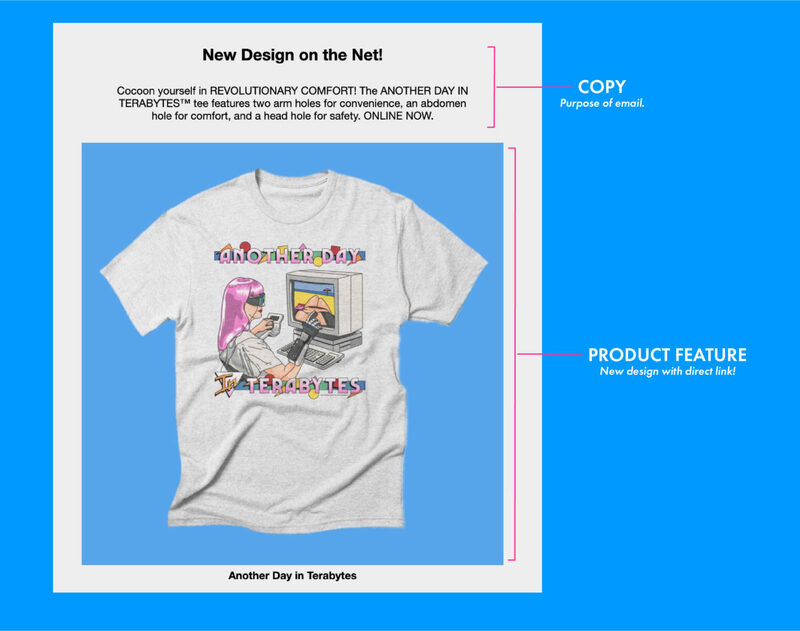 As seen in the example above featuring a new design release, the image of the t-shirt links directly to that design on their website. Aside from communicating your message within the body of your email, you also want to make it easy for customers to find your products. If you are running a promo or sale in your Artist Shop, your website isn’t the only place your readers can begin their buying journey. 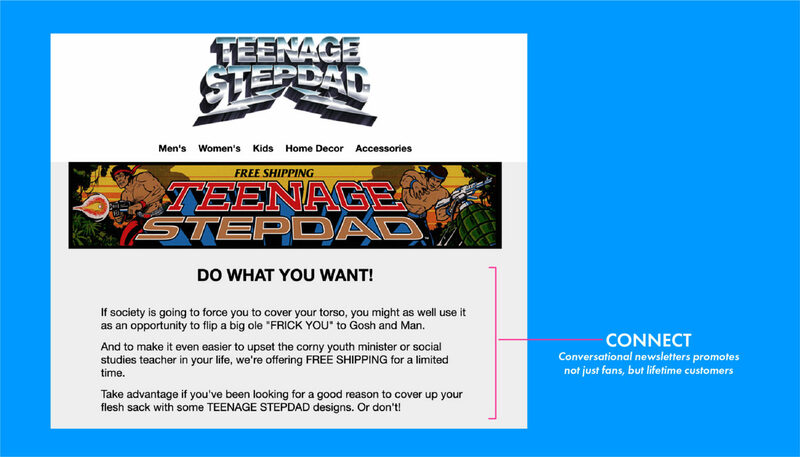 Creating curated collections in your emails allows you to feature a set of designs that you want your audience to see right away. Don’t be afraid to link directly into your catalog. The fewer clicks the customer has to make to get to the product they want, the more likely they are to make a purchase. Emails to your customers should feel conversational and easygoing. If you sound too formal in a newsletter, it could have a different impact on the reader than you intended. Maintaining your voice is just as important to your brand as the designs you put on products. Having a consistent, familiar voice will create lifetime customers and fans which, in turn, will impact your customer retention. The more authentic your dialogue is, the more your customers will want to support you and your brand! Unfortunately, not all images are visible to your customers all the time. It’s also important to consider subscribers that may be visually impaired. Some customers may have images blocked by default or they may not be viewing your newsletter on a device that supports images. Think of alt-tags as a backup text depiction of your image. This will allow the reader to still shop and get to your website, regardless of the image’s visibility. No two Email Service Providers, or ESPs, are the same. When you need something that is reliable, easy to manage, and universal, you want to use Google Analytics (GA). GA works as a central hub for every open, click, and purchase your customers make from your newsletter or website. Creating a tracking tag in your email will allow you to see if your newsletters are generating revenue and what products your customers are viewing the most. Below is an example of what the Google Analytics tracking tag looks like in Mailchimp. At the very bottom of your campaign overview, you’ll find a space to create a custom tag which allows you to view the results within Google Analytics. This will track clicks, opens, and purchases from each campaign. Having an email footer is one of the most important components of your newsletter. In order to avoid having your newsletter permanently in the spam folder, it’s legally required that you include an “unsubscribe” button. This allows your reader to remove themselves from your email list. An email footer is also where your contact information and links to social should appear. 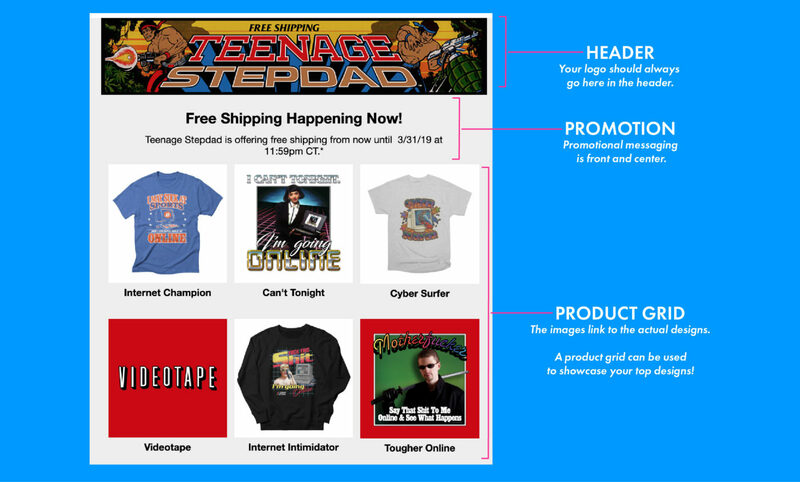 Once you’ve designed your footer in your email template, it will automatically appear in every email campaign draft. The more you strategize, the more successful your business and brand will be. By using all of the resources you have in front of you, including a newsletter strategy, you’ll grow your business and create lifetime customers! To learn more brand building tips head to artistshopshelp.threadless.com. Just an addition to your article. Here is a good infographic about the anatomy of CTR in email newsletters https://designmodo.com/design-email-newsletter/ I hope you can include it in your future articles.